Why is there a leaking balcony? A large portion of multi-storey structures such as townhouses, apartments or even offices has tiled balconies. In many cases, a tiled balcony is usually constructed directly above frequently occupied spaces, such as lounge rooms, bedrooms or offices. Every balcony is unique in terms of its durability, lifespan, products and level of exposure to the natural elements. Due to this, reasons as to why you are experiencing a leaking balcony may vary. Leaving a leaking balcony untreated can not only be a pain but can also lead to damages to surrounding rooms. If left, a leaking balcony will deteriorate over time and the level of decay produced will spread. Furthermore, an untreated leaking balcony can lead to water penetrating and travelling to other areas of the building. Consequently, affecting residences or offices. With a soon steady flow of water through the walls and ceiling. A leaking balcony could also lead to damaged electric systems, potentially risking power outages or exposing harmful sparks. The end result of all of these causes could be a collapse of the balcony, in extreme circumstances. What causes a leaking balcony? When tiles are loose and make a hollow sound when stepped on, then they are not tightly in place and water can penetrate. The tiles have become cracked or missing necessary grout. Touching wooden doors and windows expand with water ingress, making closing doors a challenge. Staining has appeared on the balcony finishing and is only growing as the leak damage increases. If there is paint on the balcony, then it could be peeling or splitting away from the surface. 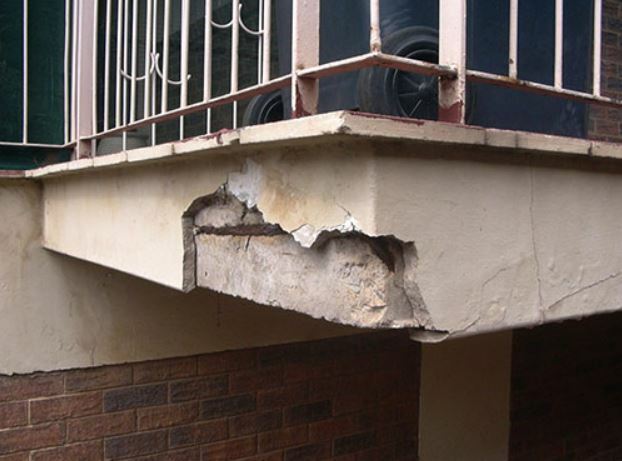 If balcony joints have weakened, then water can penetrate and cause a leaking balcony. HOW BUSS CAN HELP WITH YOUR LEAKING BALCONY? When repairing a leaking balcony, it is important to seek professional help. There are many technical skills and techniques involved in repairing a leaking balcony and the team at BUSS have the necessary tools and skills to perform the repairs.